Disruption: Customers are now sharing products and services with each other, like AirBnb (vs hotels), Lyft (vs buying cars), Lendingclub (vs banks), 99 Dresses (instead of buying clothes), odesk (vs traditional hiring methods) as an alternative to traditional sales, in fact, our small list of 200 startups only has a portion of the services that have emerged, enabling this trend. At Altimeter, we’ve been tracking this space, including a number of blog posts tagged Collaborative Economy (list of startups, list of corporations involved and more), an upcoming free webinar that you can join, and I’ll be announcing some private events for our clients to dive in further. Tomorrow, I’ll be keynoting LeWeb which is solely focused on this topic, and will share the video and slides shortly. 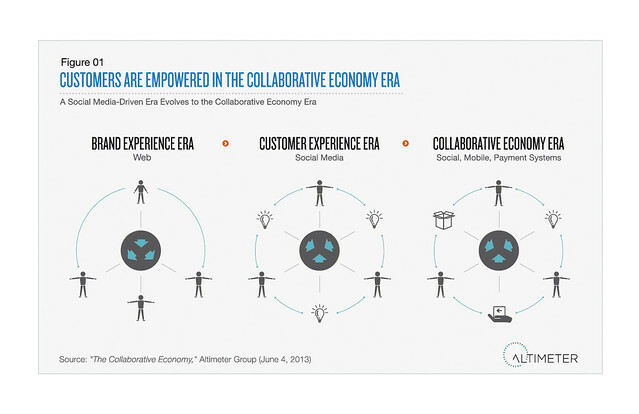 The Next Phase of Social Business Is the Collaborative Economy. Social technologies radically disrupted communications, marketing, and customer care. With these same technologies, customers now buy products once and share them with each other. 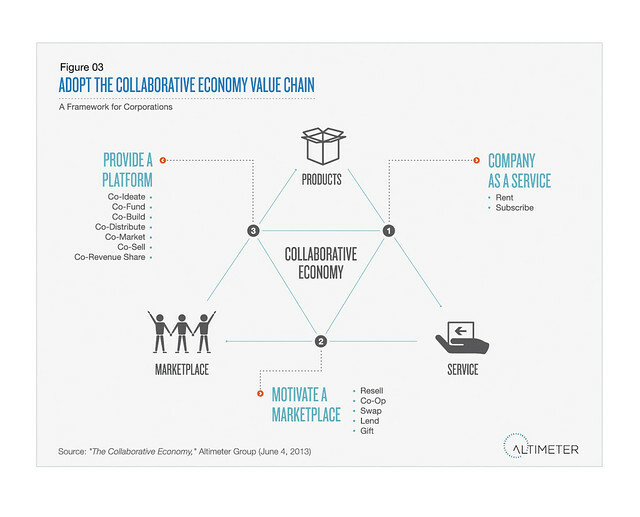 Beyond business functions, the Collaborative Economy impacts core business models. Customers Are Sharing Goods and Services — Redefining the Buyer-Seller Relationship. Every car-sharing vehicle reduces car ownership by 9-13 vehicles; a revenue loss of at least $270,000 to an average auto manufacturer. The cascading impact to the ecosystem has far-reaching impacts to auto loans, car insurance, fuel, auto parts, and other services. For corporations, the direct impact is revenue loss that results from customers sharing products and services with each other. Innovative Companies Are Already Moving Into Collaborative Economy. Some companies have joined this movement. For instance, Toyota rents cars from dealership lots, and Patagonia partnered with eBay to encourage customers to buy and sell its used products. NBC has partnered with Yerdle, a startup founded by former Walmart executives to foster peer-to-peer sharing. This movement impacts every industry. Above: In conjunction with the report launch, the findings and market opportunities were shared at LeWeb, who’s focused on this topic. Altimeter conducted a number of research interviews, as well tested the thesis with business leaders across multiple spaces. Special thanks to Loic Le Meur who triggered the ‘aha’ for me last year, on how this is the next phase. Video interview on Techcrunch. Sharing startups need to be ready when the corporations move in. The Brand Activation Association shares the report, I’ll be speaking at their event. Industry leaders, Collaborative Consumption, reminds market on the movement. Adam Tinworth took some on the fly notes from the keynote, thanks Adam! Adi Gaskell covers the report and poses some great questions. My Customer: Are collaborative customers redefining the buyer-seller network? Sprinklr, a social media management system, reviews the report. Startup website Niblitz covers the report infographic. ZDNet’s Dion, also of Dachis Group, explains how this is an extension of social business. Moxiesoft offers an infographic based off our data, with the impacts to summer travel and customer experience.